A return home from Malawi, one of the poorest countries in the world, did nothing to diminish disturbing images of the poor. In the privacy of my thoughts, the poor still begged silently for money, the shoeless children still played in garbage by the side of the road, and my neighbour still sat in front of his store hoping to earn enough profit by day’s end to feed his family. I did nothing to push the images away. I took no action to assuage my guilt. But it did diminish, although never fade, over time. My return to Africa came two years later, working in Accra, Ghana. I walked and cycled everywhere – an odd sight judging by the looks I got on a daily basis. Most people in my neighbourhood were used to seeing white people drive past them in air-conditioned cars. I resolved myself to react differently when faced with poor people begging for money. I wasn’t going to ignore them, I wasn’t going to pretend they did not exist, I wasn’t going to lie and say I had no money. I started talking to Sammy, a young man affected by polio and begging for money every day in front of the Koala supermarket near my house. Hordes of people stepping out of their cooled Land Rovers ignored him – Dammit, did I really look that awful ignoring beggars? Some gave money, most did not. As I got to know him more, I asked Sammy if he would guard my bike as I went into the store. He was more than willing to comply, and I for one was happy that my bike would be safe. I gave – not much – to others whenever I could. Giving away the change in my pocket never had an impact on my finances. At the time, I realized I felt better for two reasons: I thought the money would help those in need and I didn’t feel as guilty. Both these reasons are no longer sufficiently compelling for me. To be truthful, giving so you don’t feel guilty was never a very compelling reason. As for the money helping the poor, I know the money doesn’t always go to those in need. Walking the streets of downtown Accra with a friend of mine many years ago, I was approached by a Malian woman begging for money while holding her child. As I dug into my pocket for change my friend snapped: “Don’t giver her money!” and shooed the beggar away. “She stays here in the hot sun all day while her husband sits under a tree and does nothing. He will collect all the money and give her nothing at the end of the day. Give money to her and you’re committing her to more slavery.” Ok if that’s true. But if I do nothing, what good will that do? 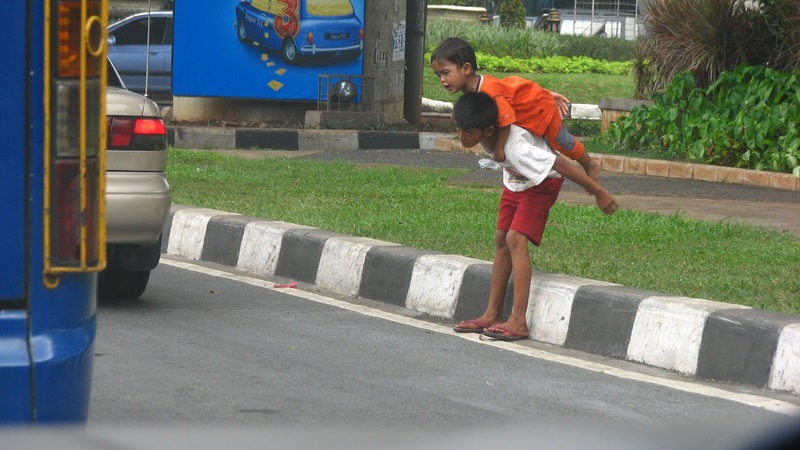 Years later as I drove with a friend through the streets of Jakarta, I asked him why there were so many children – no more than ten years old for the most part, and never with any adults around – begging by the intersections. He told me they were brought in by truck early in the morning and scattered around the busiest intersections. They’d spend the day begging for money and collected by their minders at the end of the day, who would then collect their money. BBC recently reported a similar scheme taking place on the streets of London with Roma children, some of whom can collect hundreds of pounds per day begging – and it’s money they will not see. This is child exploitation at its worst. At best, a careful reflection on the complex nature, motivations, and causes that lead people to beg leaves someone willing to help with no clear guidance on what to do. In the second or two you see someone begging on the street, from the time you first see them until you pass them by, you form your own opinion of their perceived needs, you formulate your own assumptions of their history and judge for yourself whether or not they deserve what you can give them. Your own judgment and morals are what dictate the beggar’s luck. Having seen forms of extreme poverty, I freely admit that when I see someone begging on the streets of Montreal my first thought is to say to them, “You have no idea what poverty really looks like.” The assumption might be valid but it has little relevance to their reality; if they’re begging for money on the streets of Montreal, chances are they have gotten to the point where their lives are desperate enough to warrant such an undignified act, and a comparison to someone suffering in a poor country is unhelpful. Nonetheless, a place like Montreal does offer more solutions than poorer places, from shelters like the Old Brewery Mission to community organizations offering assistance. But the number of homeless persons in Montreal is rising – 30,000 and counting. To make matters worse, homeless persons are being slapped with police fines that they will not be able to pay: a recent study showed an astounding 30,551 tickets issued over a five-year period to homeless persons in the city. It’s hard to ignore 30,000 people in a city the size of Montreal. Harder still to ignore the 1.29 billion on this planet who live off less than $1.25 a day. Changing the latter statistic will take more than handing out pocket change.